Iceland’s electricity is produced almost entirely from renewable energy sources: hydroelectric (70%) and geothermal (30%). Less than 0.2% of electricity generated came from fossil fuels (in this case, fuel oil). In 2012 there was no wind power installed in Iceland. Electricity production increased by 24 MWh/person from 2005 to 2008, an increase of 83%. According to Statistics Iceland the total electricity consumption was 7,958 GWh in 2002, 11,480 GWh in 2007, and 17,068 GWh in 2012. The aluminum industry in Iceland used 71% of produced electricity in 2011. The electricity supply and consumption were equal in 2008: 53.1 MWh per inhabitant when the European union (EU15) average was 7.4 MWh. Iceland’s consumption of electricity was seven times higher than EU 15 average in 2008. The domestic electricity supply promotes use of electricity. The Icelandic electricity market is geographically isolated. The market was closed for competition prior to 1 July 2003. Almost all electricity was supplied by Landsvirkjun and sold through regional distribution companies. Landsvirkjun had a monopoly position on investment in generation. Full market opening began in 2006 e.g. with the opportunity to switch supplier. Contracts for large scale energy users were in general long term, up to 30 years with options for extension. Landsvirkjun, the largest electricity producer, had 76% annual production in 2007.The majority of the electricity is used in industry, mainly aluminium smelters and producers of ferroalloy. Landsvirkjun does not participate directly in the retail market for households and smaller businesses. In the retail market the main companies are RARIK, Orkuveita Reykjavíkur and Hitaveita Suðurnesja.The last two have also entered into the market for energy intensive users. The households heated with electricity, not many, receive subsidies to make their heating costs comparable to hot water heating. (Wikipedia) . The following recording was recorded at Skóey island in Hornarfjörður fjord under a powerline “Byggðalína”. 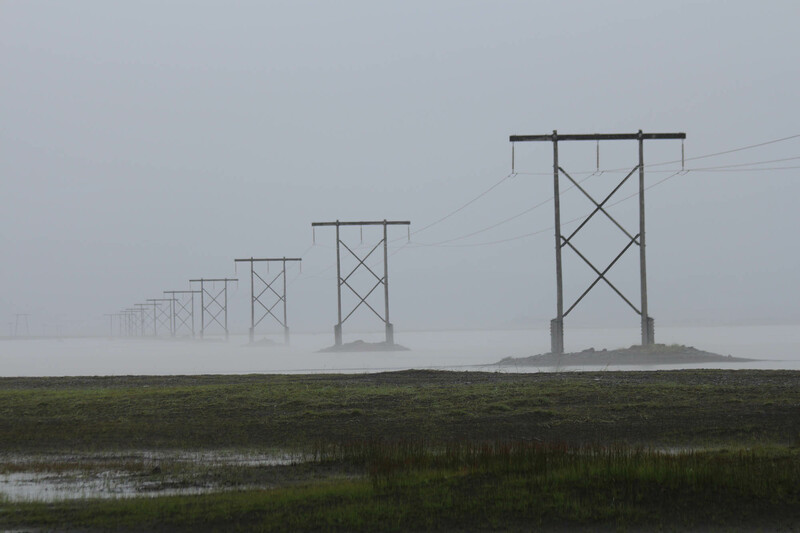 It is a 132kV powerline which connects all the regional and local electrical grids together and stabilizes the whole electrical grid in Iceland. The structure is in most parts over thirty years old and for the last several years it has been quite overloaded. 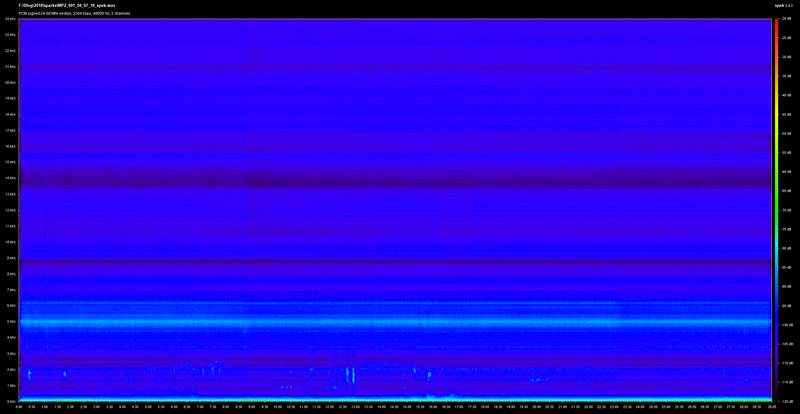 The recording was in 24bit/48Khz. Behind the aggressive electrical sound is a typical calm, quiet wetland soundscape with rumbling background noise from the ocean shore not far away and traffic. When the recording is inspected in specrogram it shows the sparks fill the whole frequency spectrum of noise, or up to 24Khz (see picture). It would have been interesting to record this sparking sound at 192kHz because the whole microphone frequency range is up to 50Khz. That is not all, because the air is massively loaded with EMF/radiowaves, from 50Hz up to several hundred kHz. The strong radio signals travel long distances and make it almost impossible to record clean spaceweather signals with VLF receiver without human electrical noise pollution.